Imagine waking up at 4am every day to get ready for work. By 5:30am, you leave your apartment, drive 90 minutes (who am I kidding; with Atlanta traffic it was a solid 2 full hours!) to work. When you finally arrive to work at 7am, you are on your feet for eight full hours, pouring into the lives of other people’s little children. When you finish with faculty meetings, parent conferences, entering grades, and trying not to fall asleep at your desk, you look at the clock, and it’s already 6pm. It has been a whopping fourteen hour day. It gets better; you get back in your car and drive another 2 hours to get back home, after doing everything humanely possible to stay awake behind the wheel (coffee, air conditioning, music blasting and calling on the name of JESUS). Upon arriving home, you are beyond exhausted. Oh yeah, then you have to work on your homework for grad school. Before you know it, it’s time for bed. As you lay your head down to sleep, you think to yourself, “Lord Jesus, I have to do this all over again tomorrow…HELP.” Readers, I know what you’re thinking—this is INSANE. Who in their right mind would go through with this? Before I graduated from UGA in 2008, I spent that entire semester really seeking the Lord about His direction for my life after graduation. My entire college experience was so blessed and forever impacted by Omega Worship Center, the ministry the Lord led me to while I was a student at UGA. There were so many things that the Lord had done in my life during my five years at my church and there was much more that I knew in my heart that He still wanted to do. So, after much prayer, and the Lord’s leading and confirmation, I made the decision to make Omega my permanent church home after graduation. This was a major step in my faith walk as a young adult. Within that same year, I started my very first year teaching as a Spanish teacher in Decatur, Georgia. And for the next 3 ½ years, I lived in Lawrenceville, worshiped in Athens, and worked in Decatur, Georgia. That season involved so much driving, late nights, and a ton of gas money! But, God definitely was a keeper. It was worth it to me because my heart’s desire then and to this day was to serve the youth and young adults in my church in this part of the vineyard. By the time the third year of “living in Lawrenceville, worshiping in Athens, and working in Decatur,” it was getting really old. I was exhausted, and felt stretched between two locations. I wasn’t feeling very effective anymore because of the toll all that driving was taking on my mind and my body. So, once again, it was time for phase II of my faith walk as a young adult. Leaving the church I grew up in was one big step; leaving home to live on my own in another city was in a league all on its own. Ladies, understand that when you begin to feel uncomfortable, complacent, or when things begin to go haywire around you, rest assured that the Lord is trying to move you out of your comfort zone. The Lord needed to cause me to feel restless, and uncomfortable for almost a year with my present place of residence for a reason—He wanted me to begin using my faith muscles again. After I graduated from college, I lived at home for three years. Although it was season that had its challenges, it was a blessing in disguise because it allowed me just enough time to grow in some areas, and it allowed my family to see what the Lord was doing in my heart and in my life, no longer as a child, but as a young adult. Back in Athens, we were in the early stages of rebuilding our youth department, and I began feeling so ineffective to my youth at my church. Because I was living an hour away, it was difficult to attend school plays, football games, or spend quality time with these young lives outside of church because of my crazy schedule. I knew the Lord began slowing tugging at my heart to make a move, to make a decision. I wanted to give my youth my best. I wanted the Lord to use me to pour into their lives and really make an impact. However, the only way I was going to be successful in doing that was to live closer to the ministry I was serving. It was time to enter Phase II of the faith walk. I find it so amazing how specific God is when He answers my prayers. It’s also comforting to know that I can find examples of God telling other men and women of God the same thing in the scriptures. Now, most people relocate because of marriage, the military, or a new job. I moved because I wanted to be closer to my church—definitely not something you hear often, especially for a young woman in my case. You see, for Haitian young women, the golden ticket out of your parent’s home is marriage. So when the Lord began dealing with my heart to move out my parent’s house to Athens, my initial thought was, “God, are you serious? You know I don’t have a ring on my finger yet, right?” I was about to embark on something huge for most young Haitian American women my age. I was going to move out and live on my own, sans a spouse. But, I’m learning that God does things out of the ordinary in our lives, in order to produces extraordinary results. Although not yet married, my move to be closer to my church was a part of my faith walk that could not fit within the confines of culture, or the expectation of family. God told Abraham to leave his father’s house, his land, and all that was familiar to him because God had an extraordinary plan and purpose waiting for Abraham in a land he did not know. Ruth left her family, her homeland, and her comfort zone to follow a mother-law back to Israel, a land unfamiliar to her. Little did Ruth know that her destiny was wrapped up in Naomi! But in Abraham and Ruth’s case, they both had to take a step of faith, and break out of what was familiar. Jesus challenged Peter to “launch out into the deep” because Jesus was calling Peter higher. You cannot catch fish in shallow water; you can’t dream big while standing in shallow water; you can’t reach your destiny and purpose unless you go out of your comfort zone. I had to leave what had been familiar to me for so long, and go into deeper waters. The Lord was requiring more out of me. So, I started taking baby steps towards my move. Before even seeing my new home in Athens, I began making buying little things like wash cloths, pots and pans, towels, etc. I was stepping out in faith! It was such an exhilarating moment with each small purchase because I knew that God had approved this, and was ordering my steps. From those little purchases, I moved to furniture. By then, it hit me—I was really going to move out on my own! By October of 2011, after much searching, I finally found the perfect place to call my own! Two desires of my heart where finally coming to pass: I was worshiping in Athens; not I was going to officially live in Athens. After I found my new home in Athens, I decided to let my parents know what my plans were. Was I nervous to break the news to my parents? Heck, yeah! I was worried about how they would handle my move, despite the direction I knew the Lord was leading me. But guess what? God proved Himself to be so faithful in that situation. When I shared with my parents my desire to live closer to my church and to serve more effectively in ministry without such a long commute, they not only supported me in the decision, but gave me their blessing. Talk about God going out before you! Even if my parents had not approved, or where not in my corner, because of the peace of God that came with my decision, I knew that He would take care of my parent’s hearts. But, with their blessing, it made the transition all so much sweeter. Not only that, my new home was two minutes from my church!! I was now able to serve with even greater effectiveness and truly be more accessible to my youth and the ministry. Life was good. For a long time, my prayer was to live, work, and worship in the same city. So far, the Lord had answered 2/3 of that prayer. The next and final phase of my faith walk was to believe God for a job that was perfect for me in Athens, Georgia—despite not seeing any jobs available in Athens in sight at the time. Twelve job applications and one interview later, I still saw no job prospective in sight, and the semester was rapidly coming to an end. There were moments when I had to fight thoughts of doubt, fear and worry. I had to constantly pull down thoughts like, “What if I don’t find a job before August?” “Maybe I should have waited to move later.” “How will I be able to take care of myself?” Now, more was at stake—rent, electric bill, water bill, car note, etc. This and more began to bombard my mind. But with the prayers and encouragement of my brothers and sisters in Christ, I was reminded of an important point—as believers, we really do walk by FAITH and not by sight (Romans 1:17). Although I did not see my new job in Athens, although I had no idea where I would be in the upcoming school year, by faith, I had to keep trusting that one existed. “Faith is the substance of things hoped for, the evidence of things not seen” (Hebrews 11:1, NKJV) I had launched off into the deep—I was too far away from the dock to go back now! I began speaking out and confessing with my mouth that God was working behind the scenes, and that something was happening, although I could not see it. I learned that faith is not having all the answers and details up front. I moved to Athens because I wanted to be closer to my church, to be about my Father’s business; this was my first step. God is concerned about that first step of obedience—after that, He’ll take it from there! Finally, the last month of the school year had arrived, and I still did not have anything lined up for the next school year. The pressure was on! The day we received our contracts, I didn’t even look at it. I left the envelope, unopened, on the kitchen counter. This was the final phase of my faith walk. After 20 intense weeks of driving 140 miles to Atlanta from Athens five days a week, waking up at 4am Monday-Friday, spending close to $400 in gas money a month, and adding over 15,000 in mileage to my car, I could not waver in my decision to trust God with everything. The day to submit our contract for the 2012-2013 school year finally arrived. Rather than renewing my contract, I gave my resignation letter instead. On May 9, 2012, I was making my final leap of faith in this whole journey. I wasn’t fearful, doubtful or scared—I experienced a peace that assured me that God was on my side, and would not leave me out to dry. What happened just a few days later BLEW MY MIND. Exactly four days later, SIX Spanish teacher positions opened up at three separate schools within 5 miles of my new home in Athens. AMAZING!!! Had I wavered in my confession, backed down and renewed that contract, I would have totally missed out on God doing exceedingly and abundantly ABOVE what I could ask or think! I applied for all those positions that following week. That made a total of eighteen job applications. It gets better. Exactly two weeks after submitting my application for the six Spanish teacher positions, I receive a phone call from one of the high schools in Athens where I student taught five years ago. They wanted me to come in for an interview! My first interview was with the University of Georgia to work with college students. Now, this second interview was to work with high school students. When I came in for the interview, on the panel was not only the principal and the foreign language department of the school, but my mentor teacher from when I was a student teacher! Can you say favor?! When God is blessing His children, He goes all out! The interview went incredibly well, by the grace of God. My mentor teacher from five years ago still had very pleasant memories of me from five years ago which he shared during the interview process. Within the next three days, I was offered a position as one of their Spanish teachers at the school. Exactly one month from turning in my resignation letter and stepping out on faith in this area of my life, God blessed with me my new job in the Athens Clarke-County school district. God Almighty made room for me to not only worship in Athens, but to now life and work in Athens, Georgia. Not only that, but one of my youth at my church is a student at the same high school where I will be teaching. I can now be an impact in her life not just in the house of God, but at her school as well. Our obedience to the Lord’s leading will not only bless us, but it blesses those connected to us. Is God faithful or what?! So friends, this was my faith walk. This was an opportunity for me to flex my “faith muscles.” I learned that God really is impressed and is excited about faith. 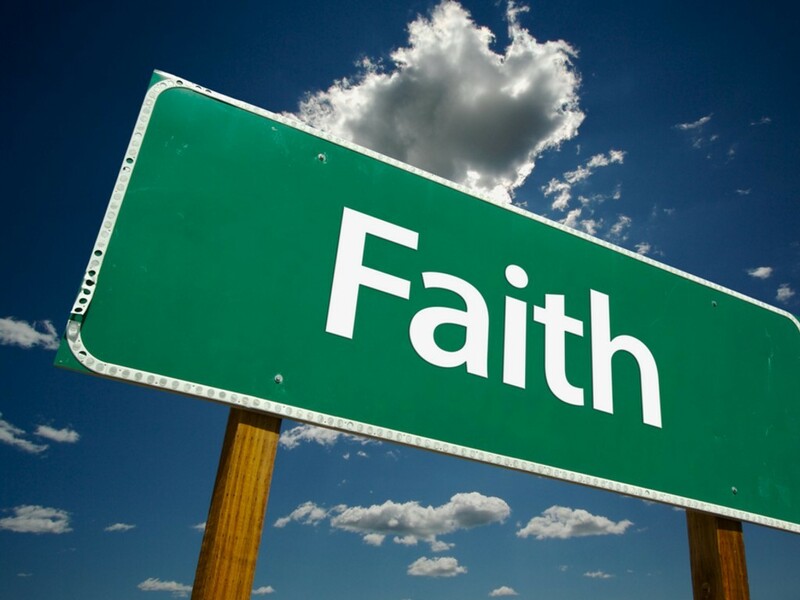 Only a few people in the Bible had faith that moved God. I’m glad to say that I too am one of them. I’m looking forward to next opportunity to step on faith. I know that God will not fail to bless me beyond my wildest dreams. Wow…What a remarkable faith walk and testimony. Thank you for sharing your awesome experience and faith. This is very encouraging! Believe, have faith serve and love your God. Love you and miss you already. We will definitely keep in touch. Your school is blessed to have you! WOW. I had never read a long blog with so much attention like this. That was very deep and very inspired! I have had noticed big things in you since the first day that I have met your at GSHAC. When you jump for God, God jumps higher for you. Thank you for sharing! Be blessed Larissa!